Editor’s Note: The following is the cover story from the August issue of RISMedia’s Real Estate magazine. From the widespread ripple effect of the Brexit vote to the staggering investment made by Chinese homebuyers in the U.S., there’s no denying residential real estate has become a global industry. With a parent company that already has worldwide recognition, Berkshire Hathaway HomeServices had global expansion planned when the brand launched in 2013. Now, heralded by a new website designed to facilitate international business like no other, the real estate brokerage franchise network readies itself for phase two of the plan: awarding Berkshire Hathaway HomeServices franchises in key markets around the world. 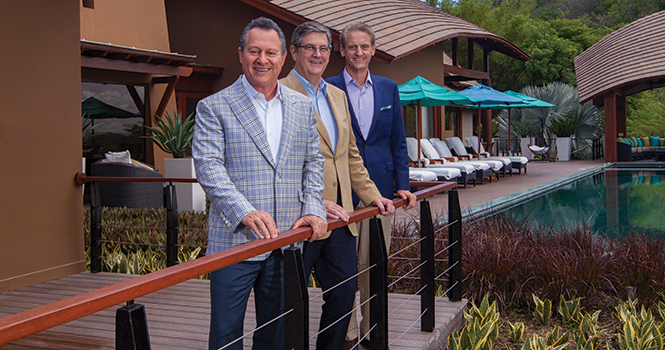 To head up global expansion, Berkshire Hathaway HomeServices brought on global real estate franchising veteran Peter Turtzo one year ago this month. Serving as the brand’s senior vice president of International Operations, Turtzo has been responsible for establishing the strategy and process for growth into international markets. Phase One: Bringing the World to the U.S. Phase one of the two-pronged plan rolled out with the May release of the new BerkshireHathawayHS.com, replete with rich features to engage a global audience. Thanks to sweeping upgrades nearly a year in the making, BerkshireHathawayHS.com has become the industry’s first site to showcase the complete U.S. property database—translated into 10 foreign languages—to the world. BerkshireHathawayHS.com translates property information into: Chinese; French (European); French (Canadian); German; Italian; Japanese; Portuguese (Brazilian); Portuguese (European); and Spanish (Latin American) and Spanish (European). The most striking feature of the site, however, is its ability to bring full MLS data to buyers around the world—a feat that has yet to be taken on by other brands. “Compliance represents a high barrier to entry into the full MLS data space,” explains Phillips, preventing brokers from making the leap to this point. BerkshireHathawayHS.com now breaks this mold by presenting full MLS data in home-search results. The bold move is a smart one considering the significant influx of foreign buyers in the U.S. According to the National Association of REALTORS® (NAR) 2016 Profile of International Activity in U.S. Residential Real Estate, between April 2015 and March 2016, foreign buyers purchased $102.6 billion of residential property in the U.S. A total of 214,885 U.S. residential properties were bought by foreign buyers (up 2.8 percent), and properties were typically valued higher ($277,380) compared to the median price of all U.S. existing-home sales ($223,058). The user experience for the foreign buyer was designed to be simple and welcoming. With one click, BerkshireHathawayHS.com visitors can choose their language, and the website instantly translates. Site translations are performed and checked by linguists—not machines—so they are clean, accurate and respectful. The site seamlessly converts currency and measurements. As consumers register on the site, they unlock proprietary “Inside Access” features, including the latest pending and sold information, specialized market reports and property-price history. To augment global business for its U.S. franchisees, Berkshire Hathaway HomeServices teamed up with Worldposting to syndicate most of the network’s residential listings priced at $200,000 and above to 70 global websites serving consumers in 37 countries on five continents. Text and pictures are updated daily and sent automatically to many of the world’s hottest search sites. According to Blefari, this new global reach gives Berkshire Hathaway HomeServices associates a distinct advantage at the listing table where today’s sellers—particularly in the luxury arena—are looking for the best-possible exposure. Now their homes will be brought to an international audience. With the global website strategy well underway, Berkshire Hathaway HomeServices is now looking to phase two of the plan: establishing franchises in key markets around the world. Initial focus includes London, Berlin, Munich, Paris, Madrid, Rome, Sao Paulo, Rio de Janeiro, Beijing, Shanghai and Singapore, major financial centers where Berkshire Hathaway’s corporate name recognition runs high. The network will use similar restraint in its selection of franchisees. “Our objective is quality affiliations with established, reputable real estate companies who will properly represent the Berkshire Hathaway HomeServices brand,” says Turtzo, who expects a positive roll-out of international franchisees—and is already fielding an increasing number of inquiries. In June, the firm gained favorable reviews among the British press after the brand announced its expansion plans to international media. At press time, Turtzo was soon to announce the appointment of a managing director of Franchise Sales for the EMEA region. Contrary to the global franchise business model most U.S. real estate brands employ, Berkshire Hathaway HomeServices foreign franchisees will operate under a direct franchise model, linking them straight to the brand’s home-base in Irvine, Calif.
For Berkshire Hathaway HomeServices, the investment required to facilitate the direct franchise model is well worth it as it will help ensure the brand’s quality around the globe. According to Turtzo, Berkshire Hathaway HomeServices’ path toward global expansion will be an “inch-by-inch” process. As Berkshire Hathaway HomeServices franchisees in the U.S. prepare to service a new pipeline of foreign real estate consumers, the brand is focused on increasing training through the National Association of REALTORS® (NAR) Certified International Property Specialist (CIPS) designation.